In default mode, NDU runs "in the background" to deliver updates automatically as soon as new data becomes available. It can also be set to allow manual updates only, or to provide an update at a scheduled time. The setting can be changed at "Settings > Update Mode". Regardless of the setting, updates can be performed at any time by clicking the "Check for Updates" button on the Update page. Whilst these applications are allowed to be open when an update occurs, a user may elect to disable automatic updates before a trade simulation is run. If an update occurs part-way through a simulation, then some prices used in the simulation will be up-to-date and some won't. If the same simulation is run once all the data is up-to-date, the results may be different. 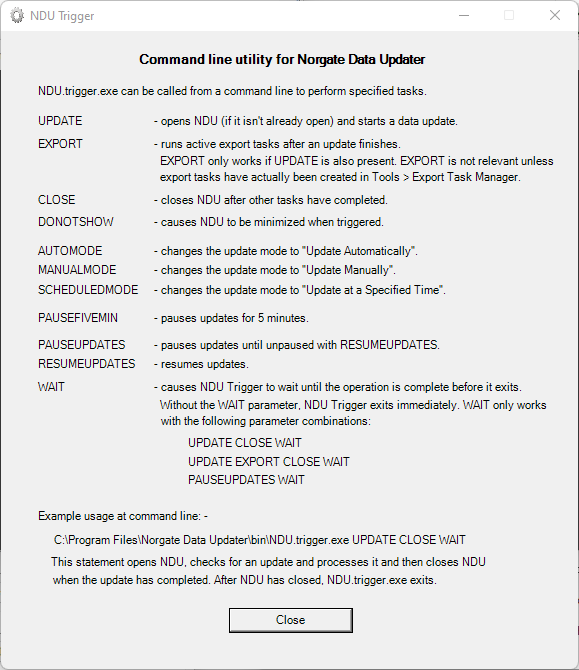 A utility called "NDU.Trigger" is provided in the "Norgate Data Updater" folder, which can be used to open NDU, start an update and optionally close NDU according to command line parameters. Please note: If NDU is being scheduled to do updates via NDU.Trigger, then the Update Mode under "Settings" is best set to "Update Manually" so that update attempts can't clash. Updates for market groups like ASX Stocks, US Stocks and Futures are delivered in a series of Editions, starting with the "Initial" edition for a day and ending with the "Final". An Update Schedule is provided at "Information > Schedule". The Schedule is subscription-specific and displays dates & times according to the user's local clock. It shows a 24-hour schedule with the starting point being the current time. The times shown in the Schedule are indicative. This is because data arrives from upstream sources within time-ranges, rather than at specific times. Some ranges are wider than others. The Schedule can be filtered by "Database" to isolate particular times. For instance, a US Stocks subscriber can isolate the times for US Equities, US Indices or World Indices. The Editions Report can be accessed via a hyperlink on the NDU Update page. If the Final Edition for a trading day has not yet been published, the Report will show information about the last edition published and the next edition due. If the Final Edition for a trading day has already been published, the Report will only show information about the next edition due, which will be the Initial Edition for the next trading day. If an edition is running late, the Report will indicate it accordingly. If an edition is running significantly late (typically due to a problem at the upstream source), the Report will show it as being "Delayed". In addition to delivering regular price (and volume) updates for securities, NDU provides information about securities. This information can change at any time and be published at any time. Similarly, corrections may be published at any time. To identify the Last Edition received for any particular database, click on the Database tab. To temporarily pause updates for a particular database, click on the Database tab, tick the database in question and click the Pause/Unpause button. To remove old databases that are no longer being updated (and reclaim disk space) click on the Database tab and then click "Cleanup". This will remove all databases where the State is "No Subscription".